Maybe, just maybe, Garth Turner was wrong! Maybe the Home Price Index is actually a superior way of tracking market conditions compared to tracking average and median prices. Kevin from the Saskatoon Housing Bubble Blog was messing around with Saskatoon's HPI the other day and I decided to do the same for Toronto. 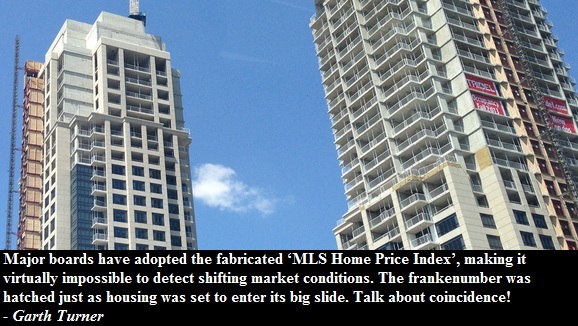 I found that Toronto's HPI is painting a surprisingly different picture. Different, but not necessarily rosier. 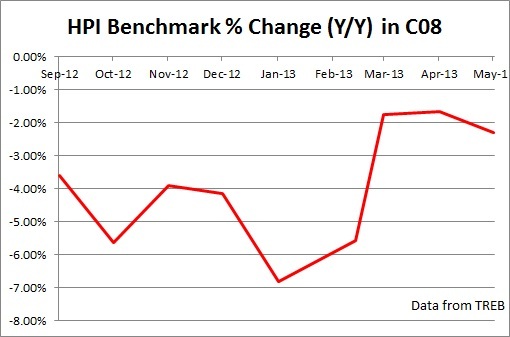 It looks like HPI is not seasonally adjusted. First of all, there is not a single mention of the HPI having been seasonally adjusted in its methodology guide, and second of all, TREB compares benchmark index on a year-to-year basis. Below is the HPI graph that I have created for a composite HPI in both the GTA and the City of Toronto. Notice a seasonal pattern. 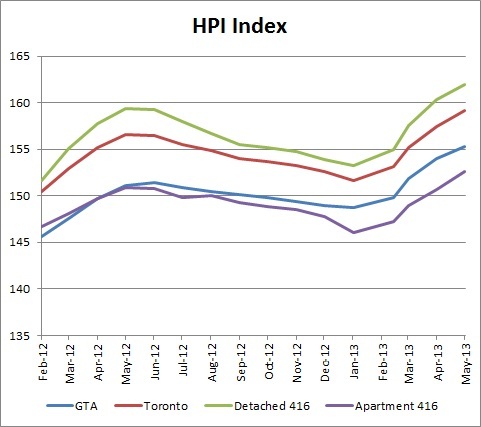 In the following graph I compared year over year changes in HPI, average and median prices for apartments in the City of Toronto. Finally, I zoomed in on the eastern part of downtown. As you can see, condo prices have been falling in C08 since August of 2012 according to Home Price Index. 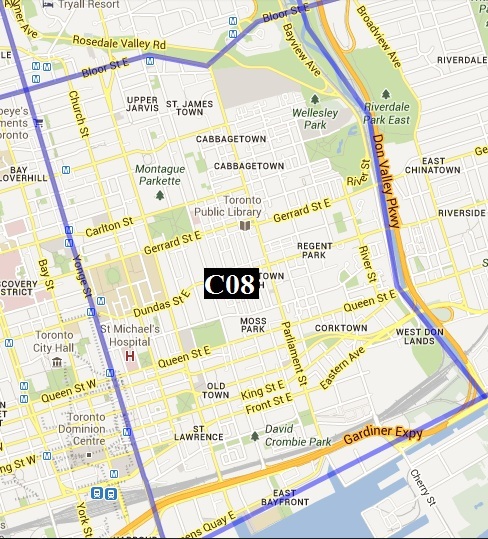 For example, in January 2013 condo prices fell over 6% in C08. Yet when you look at the average and median price change on Y/Y basis for C08, the picture would be a 4% and 1% increase respectively. 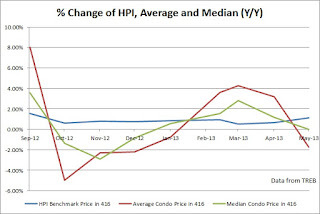 Overall, it looks like the HPI is painting a bleaker picture than originally anticipated. 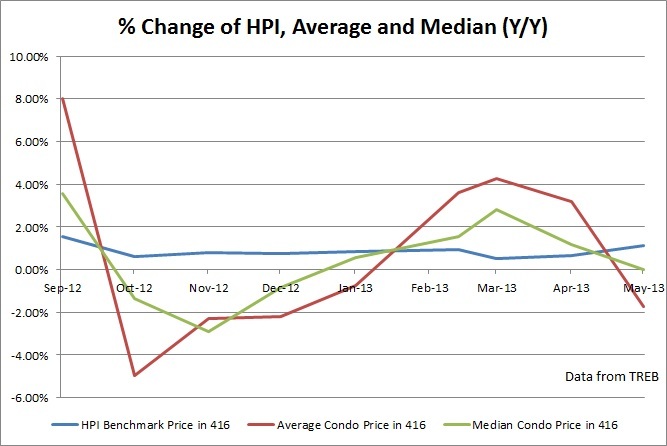 While the average price in the GTA went up by 5.4% last May, the HPI only went up by 2.8%. 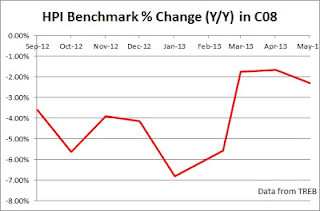 I wonder whether the HPI accounts for inflation as that would partly explain its patterns.